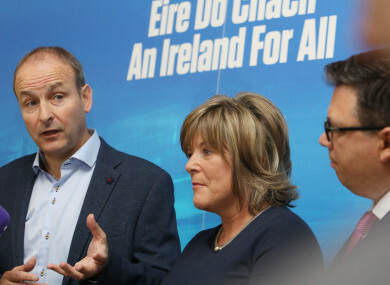 Party Leader Micheal Martin, Mary Butler TD and Cllr Paul McAuliffe speaking to the media. THE FIANNA FÁIL Ard Fheis has voted by a significant majority to support a motion which calls for the party to oppose “any attempt to diminish the constitutional rights of the unborn”. A number of speakers spoke in support of the motion put forward by the Kildare North cumman. An opposing motion, which called on the party to support a “woman’s right to choose in the forthcoming referendum on repealing the Eighth Amendment of the Constitution”, and asking that women are respected with access to all possible routes to the best outcome for them without the need to travel out of the jurisdiction, was defeated. The health session of the party’s Ard Fheis was dominated by speakers who classed themselves as pro-life and pro-choice. The debate was largely respectful, with large outbursts of applause from the audience in the packed out Minerva Suite in the RDS. Former Senator John Hanafin urged there be no change to the Constitution stating that he is the father of adopted children and noted that adoption agencies are now closing down. He told his party colleagues that there is never an unwanted child. Councillor Jennifer Cuffe of Dún Laoghaire Rathdown County Council said the party could no longer ignore the issue of abortion, and called on her party to support a woman’s right to choose. Christina Mulhill from Kerry also said the party could no longer “stick its head in the sand” on the issue and “ignore these women” that are travelling abroad for abortions. Another speaker voiced his opinion that life begins at conception, stating that the Eighth Amendment protects children, while another said the motion to support women’s right to support the repeal of Eighth puts the “party into a strait jacket” and could “sunder” the party, which other speakers disputed. Some of the speakers criticised the media for “aggressive coverage” of pro-life groups, with others questioning the work of the Oireachtas Committee dealing with the recommendations of the Citizens’ Assembly. One Fianna Fáil speaker asked for the party to show “compassion”. She said it was time for the party to move into the 21st century. Contributor Eoin Nealon asked Fianna Fáil members to support the London cumann motion, stating that he did not believe the “black and white” lines in the Constitution do not deal adequately with all scenarios. Parliamentary party members also addressed the room, with Defence spokesperson Lisa Chambers defending the work of the committee, stating that it was being conducted in an impartial manner. Billy Kelleher, health spokesperson for the party, reiterated Chambers’ point, adding that he wouldn’t sit on the committee if he thought there was already a predisposed outcome already determined. Mary Butler declared to party members that she was pro-life and a defender of the unborn, with her speech leading to a spontaneous applause from members in the room, with many standing to their feet. Anne Rabbitte said she was too, but was also “realistic”. Margaret Murphy O’Mahony said she could never approve of the abortion of disabled children. Despite significant numbers voting not to diminish the constitutional rights of the unborn, the party members will not be bound by such a motion. Fianna Fáil leader Micheál Martin clearly stated yesterday the issue remains a matter for the individual conscience of each party member. “Every parliamentary party member will have freedom of conscience to vote when a decision eventually comes before the Oireachtas. That has been a position since a number of years ago,” he said. “The fact there are two different motions illustrates the position across society. What I will be calling for in the first instance is that the tolerance of divergent opinions be the touchstone of our debate on this, not just here, but across society. That is absolutely essential,” he said, adding that there is good work being done by the Oireachtas committee examining the Citizens’ Assembly report on the Eighth Amendment. Martin said he has been watching committee proceedings and will be reading the transcripts of the expert opinions, adding that he will be making his position on the Eighth Amendment clear after the committee delivers its report in December. He reiterated that he is in favour of a referendum on the issue being held to allow the public have their say. Email “Fianna Fáil Ard Fheis vote to protect rights of the unborn ”. Feedback on “Fianna Fáil Ard Fheis vote to protect rights of the unborn ”.